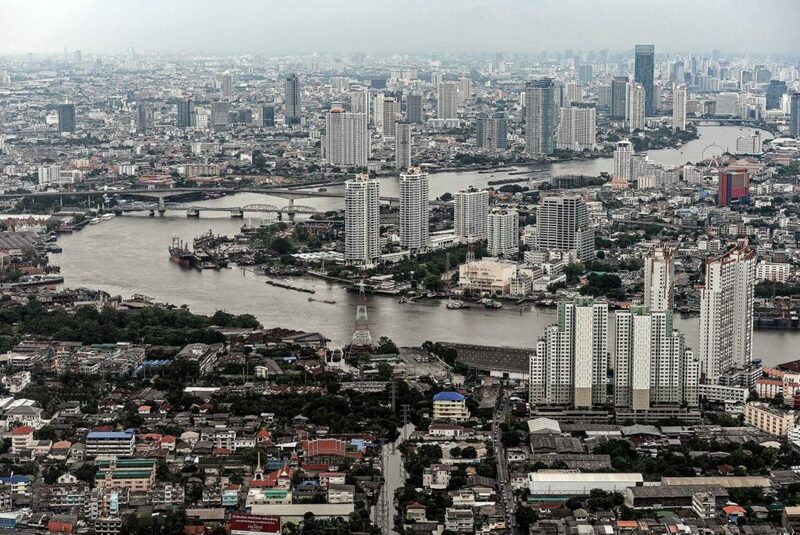 A general view of the Bangkok skyline and the Chao Phraya river. 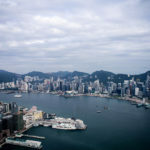 The World Bank on said developing countries in East Asia will grow as they benefit from a stabilizing global economy and withstand the impact of U.S. stimulus cuts. However, the Bank said larger Southeast Asian economies, including Indonesia and Thailand, will face tougher global financial conditions and higher levels of household debt. 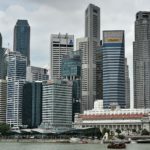 Rapidly growing urban centers will be responsible for most of the ASEAN region’s economic growth over the next few decades, but many local authorities in the region “are struggling to manage expansion while keeping up with the rate at which their populations are increasing,” according to a new Economist Intelligence Unit (EIU) report. ASEAN is currently home to five megacities (population of more than 10 million), four large cities (5-10 million), 20 medium-sized (1-5 million) and 21 small cities (500,000 to 1 million). 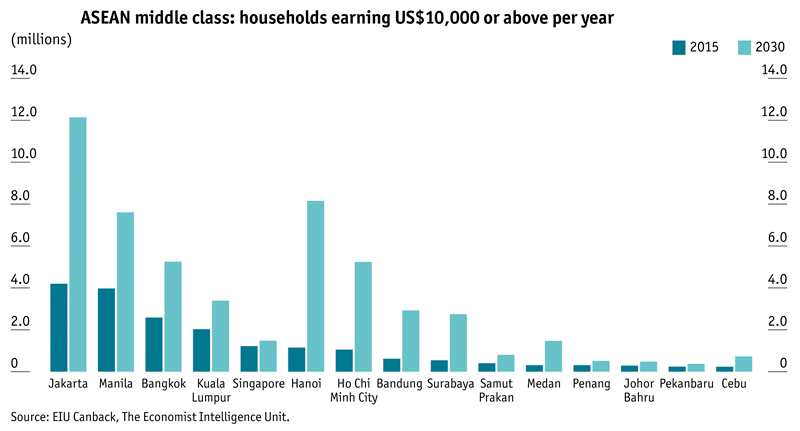 It is primarily these cities that will be responsible for the increase in the number of middle-class households in ASEAN from 38 million in 2015 to more than 161 million by 2030, the report said. ASEAN is already the sixth-largest economy in the world, with a combined gross domestic product (GDP) of $2.4 trillion, and is expected to grow at an average rate of 4.6 percent over the next five years. These numbers translate into manifold opportunities for businesses and investors. 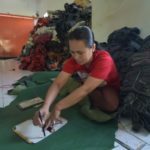 The emerging economies of Indonesia, Vietnam and the Philippines are seeing a boom in middle-class consumers with increasing disposable incomes. This is coupled with wider access to financial services such as loans, resulting in greater spending on goods and services. However, a generalized profiling of the middle-class consumer in the ASEAN is not possible because of the striking difference in consumer expenditure levels between its member states. In Singapore, for example, median household income is expected to grow from $105,200 to $157,300 from 2015 to 2030. 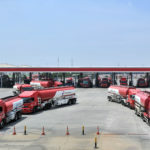 In Bangkok, it is expected to increase from $12,392 to $27,660 in the same period, while in Yangon, it is expected to increase from $4,100 to $14,700. 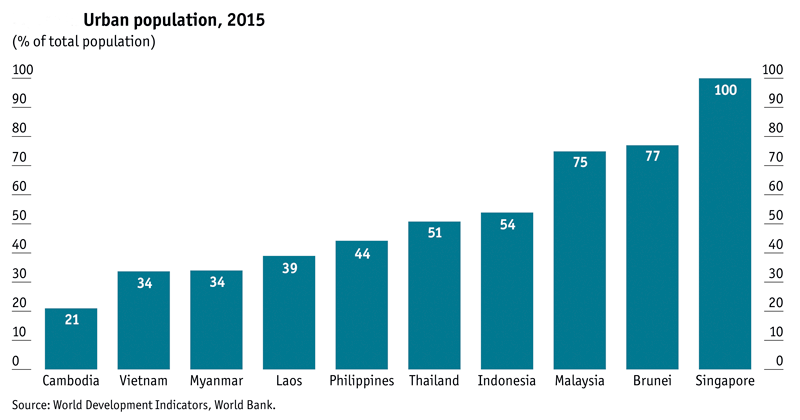 Investment in several ASEAN cities continues due to low labor costs, but competition is causing a shift in the direction these nations are taking. 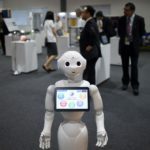 For example, Jakarta is shifting focus toward higher value-added manufacturing and the tertiary sector and has become a hub for technology-focused start-ups. Similarly, Bangkok is also fast becoming a center for higher value-added goods and services. The city’s continued pre-eminence as the region’s leading tourist destination and the persistent growth in tourist arrivals also provides significant opportunities for high-end retailers, the report said. While there are unique characteristics to each of the cities that provide opportunities for businesses in certain sectors over others, the overriding theme across the region is one of rapid urbanization. These cities are responsible for a major part of the region’s economic growth and also home to a growing and increasingly more affluent middle class—the source of even greater economic opportunity. 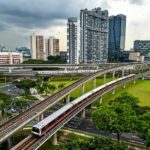 However, the report cautions that while the growth story and forecasts present great opportunity, ASEAN cities are still grappling with basic problems and without “skillful management,” cities could face a multitude of problems such as congestion, crime, urban poverty and pollution among others. As they evolve, these are pitfalls ASEAN cities need to address.